Welcome to this spiffy journal where you’ll get a taste of the life of a successful working musician, without the Debbie Downer stuff. If you wonder what goes on before, during, and after gigs, and if you’re curious about what a professional harpist does in her spare time, you’ll feel comfy here. You may even find yourself expanding your musical horizons by delving into these posts. Harp music is like the sun–It’s for anyone and everyone who wants to bask in its warmth, without regard to race, religion, and politics. So is this blog. It steers clear of controversy. You’ll only find thoughtful and offbeat musings of my experiences. And I have plenty of them to share. Why take the time to peruse this blog? It’s got more in-depth spice and insight than my Facebook and Twitter feeds, and you’ll discover what matters to a 30-year professional harpist who performed on a Grammy® Award winning album (not many of us out there). Looking for my website? Want to check out my bio details? You’ll find a plethora of info, particularly on my site’s About Page. Go there and roam. 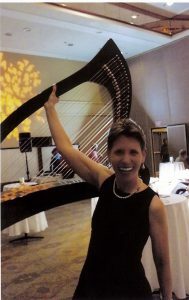 • I’ve been playing, teaching, performing on stage, TV, and radio, recording, and doing just about anything else that involves the harp for far too many years that I can count. Haven’t yet used the harp for shooting arrows in self-defense, but I suppose there’s always a first time for everything. • I promised my immediate family to keep them out of this blog, and all social media, and so I shall. My pet parrot has no say in the matter, however. • Post a relevant comment at the bottom of an article, and you may have the chance to receive a gift. The freebie may be a physical harp CD, an album or song download, tickets or coupons to one of my upcoming concerts or events, or some other token of thanks from me to you. Read the particular article to discover what’s up for grabs when you decide to enter the discussion. • Email me questions to answer and topics to cover, and I may just use your queries as a springboard for a blog post. I’ll mention you (if you’re okay with that) and offer you one of my CDs or albums as a gift. This blog isn’t a “Dear Diary”–It’s an interactive journal. Please dip your toes in and get wet. I want to avoid boring you, so I dearly need your input. • I have an insatiable appetite for new music and performance ideas. Even if your suggestions are out-of-the-box, send me your music requests, and I’ll consider working up an arrangement, just for you. I may record a snippet of the result and post it here, or I might include it in an upcoming performance or album. You’ll get mention, and a free CD or download as my thanks. • Post flattering photos and videos from my performances and public happenings in the comment section of a post, and you’ll have an additional opportunity to receive a free download or CD of your choice. Note that the operative word is “flattering”–Anyone who appears in your photo or video wants to look absolutely lovely, dahling. • As a real-life, working musician, I need to perform to pay the bills. Invite me to play at your upcoming event–a wedding, black tie function, concert, or other soiree–and get a discount off of my performance fee. All you need to do is mention this blog when requesting a quote from me over the phone. • Offer a sizeable investment in my future projects, and I’ll think up an even grander way to thank you–Lunch on me, private concert via Skype, who knows? I’m open to suggestions. What constitutes a “sizeable” donation? There’s no hard-and-set rule. If I fall off my chair when I receive it, that’s large enough, and you’ll definitely hear from me, personally. As a working musician, it doesn’t take much to wow me. How did this blog get started? Not much history on it. I have a couple of ancient blogs that I abandoned long ago, and they are still floating about the Internet stratosphere. Haven’t figured out how to pull the plug on them. So, this is my official blog, as of 2016. Blog posts will stay short and conversational, unless I get going on a long train of thought. If you are looking for longer tomes from my other website-writing ego, visit my YourWebWriter.com blog and my posts at the MooreThanSEO.com website. I think that covers it…Thank you so much for reading and contributing with your comments, photos, and videos.